Hi there, this is Ricardo. I thought I would share with you the very first piece of writing I did in English, which I found while putting my hard drive in order. Of course before posting it here, I gave it another look to correct grammatical mistakes. I mean I hope to have improved in the last ten years as writer in a second language. Now this is a very small piece of fiction, lets say is more a brief character piece that was meant to be expanded (and maybe I will expand someday somehow, taking advantage of the upcoming new movie). The idea is what if Vader survived Return of the Jedi thanks to Luke and now he is hidden, trying to work his way back to the Light Side in secret, like a recovering addict, and is keeping a holocron diary recording his inner thoughts. I hope you like it. Today, if I´m right, my son, Luke, will come to pay a visit, as sometimes he does. I don’t blame him if he still feels uneasy, after all the things that I did, to him, to his friends, but he is different from me, while I still have anger inside of me, he doesn´t, he is in full control of his feelings.. Oh Padme, you would be proud that your kid is now a Jedi Master and a very powerful one. After the lightning of the Emperor struck my heart, I was sure that death was close, I even asked him to remove my helmet to see him with my real eyes. I felt the last of my breath escaping my burned lungs and my eyes losing the last sight of true colors, reflected in Luke’s eyes, ones that are like to my own eyes, but also hopefully have the spirit of my mother. Strange enough was the fact that I woke up, a few days later, in a medical chamber, a secret one, where Luke spent some time, helped by a medic android, repairing not only my hand, but my vital systems. Still now, I don’t know why or how Luke kept me alive. Maybe he did so because he wanted the opportunity of knowing his father better, the awful being who tried to turn him to the dark side. Maybe it is because he is a good spirit who believes that I can reach the redemption or just maybe, because he feels alone. Being the only Jedi in the Galaxy is a heavy weight, with no one to share the fears, the doubts, the responsibility of carrying the hopes of a renewed order, and that was only my fault. He made a fake burning ritual, burning a knock-off of my suit, since he knew that I would be sentenced to death if the Rebel Alliance upper echelons knew that I was alive. He hid that fact too, in order to avoid more pain to his sister, Leia. Ironic that the Rebel Icon, the spirit of the Allaince was my daughter, the same little girl that I tortured in the Death Star, that I forced to witness the destruction of her adoptive home planet and the mistreatment of her now husband, General Solo. Indeed, Padme, when I see Leia, I see you in her eyes, her voice, and in her resolution to fight against the odds for the helpless. She is your daughter in every sense of the word. Leia has your fire, is so alike to you as I would wish Luke was to me when I was more human than machine. Thus my son had a great idea, at least for him, he surely has the ironic knack of you, Obi Wan. 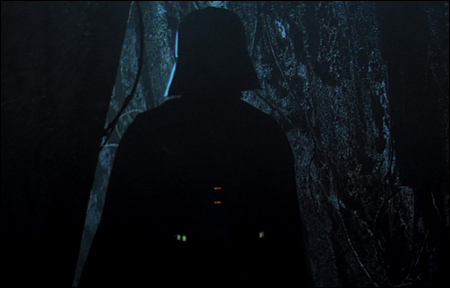 He left me here, in Dagobah, a forgotten planet, where next to Master Yoda´s hut, lurks the ancient evil of a dark side user, trapped in a tree, probably, the best place to hide a former Dark Lord who is now searching for peace. Even more ironic is the fact that now, in some way, I’m the student of my son, through the ways of a new Jedi code, which Master Windu would find quite heretic... Love for someone special, love without attachments, freely given, freely received, appreciated for its fragile existence and eventual demise. At least he is strong enough to love without any attachment… I have a lot to learn yet from him, although sometimes I feel anger to be alive, trapped in this mechanic body … and then I feel also the dark side running through me, enticing me, with its seductive voice, whispering me to conquer the galaxy now that Palpatine is dead. Only the memory of the selfless sacrifice of my son to bring me back no matter if he had to give his life to redeem the monster I was, that I still feel that I am. Remembering the strong will of Snips, my former padawan, keeps me on track. The patience that Kenobi tried to teach me for years, now a guiding example. The fire burning in my heart is only put out by the memories of the tears that Padme shed for my cause. Luke said in his teachings that emotions and memories like that could be used as a tether to return to the light side. His wisdom grows with every moment he used to find a way to keep me in check, like an addict in the way to recovery. And where I was prideful once, as padawan and master, now I humble myself as a willing apprentice. Ha, maybe there is still hope for me if my son bears with me long enough.